I am struggling trying to recall a weather system quite as strange as Gener, a.k.a. Saola internationally. First of all, while it skirted the outer fringes of the Philippine Area of Responsibility or the PAR, it never really made landfall except way up north. Next, at its peak while in the PAR, if memory serves me right it was no more than 130 kph with peak winds of 150-160 kph. Good for a ‘mere’ Signal Number 2, if I’m not mistaken. Yet, its effects went on for days! It was supposed to leave the PAR last night; and, indeed, we are getting sustained sunshine outside for the first time in days as I write this. But even as late as yesterday, when it was on the verge of leaving the PAR, there were still severe gusts of wind that blew and then died down as quickly as they came. Gener was supposed to just breeze through the PAR on its way to China. Regrettably, a ridge of high pressure up north was blocking its passage and its speed was reduced to a slow 7 kph. 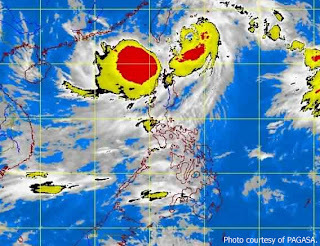 Still, except for areas up north which were directly affected by Gener’s wide circulation, for most everyone else, it was not so much the weather disturbance that was causing all the trouble but, instead, the monsoon winds that it pulled towards it. Consider this: from where Gener stalled somewhere in the Batanes area to Batangas as the crow flies (Google Earth ruler) is roughly 580 kilometres. It will take probably just short of one day to get there by road travel. Yet, the skies here in Batangas were sun-less for the better part of four days and the winds did not just blow; they whistled! The whistling, as everyone knows, only means that they were passing through at speeds typical of storms. Remember, however, that the storm was way up north! As ever, the coastal areas here in Batangas – as elsewhere in Southern Tagalog – took the brunt of the damage brought about by the monsoon winds. Homesteads were either ripped to shreds either by the whistling winds or storm surge. Storm surge. Hmm... Fancy technical term used by weathermen. This happens when strong winds blowing along the floor of the seas push the waves higher than they normally are as brought about by the tides. The surge of water pushes farther inland to destroy coastal properties or bring floods. So why, one may wish to ask, do people build their homes perilously close to the surf in spite of this phenomenon called storm surge? Because although it has happened before, it was never to same extent as was brought about – albeit indirectly – by Gener. At least three old women interviewed by news crews whose homes were swept away by storm surge all had the same thing to say. None of them had seen anything like this before! Then there were the fisherfolk whose lives depend on their daily catch. The waves were too dangerous to risk; so many of them at least had the good sense to stay on land. Where food for the tables would come, since there was no catch, that was problematical. Elsewhere, of course, the scenario has been much worse. Floods have become a way of life, regrettably, in coastal communities in the northern cities of Metro Manila and Central Luzon. The nightly news videos are painful to watch even if people bravely if resignedly go about their daily lives. 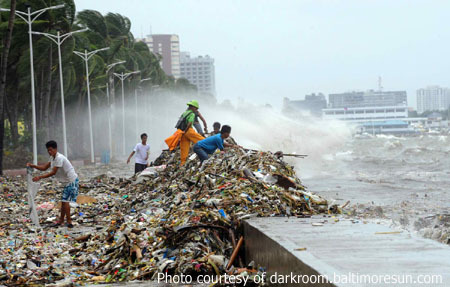 Then there were the tons upon tons of garbage dumped upon bay walk along Roxas Boulevard by the surge. I rather tend to be unsympathetic about this, though; seeing as I and everyone else do that the problem is primarily self-inflicted. 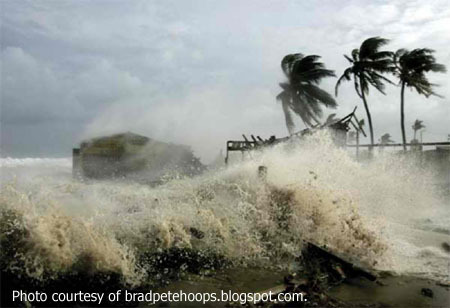 High as Lipa is, we are naturally spared from having to worry about floods or storm surge. Trash was still a problem, however. Agrarian as the city still is to a great extent, the garbage problem brought about by the winds came in the form of fallen branches, twigs and leaves. No more than a minor inconvenience, admittedly. As for the weather itself, even as late as yesterday when Gener made its belated and grudging exit out of the country, the weather was still nothing if not weird. It would be still for long periods of time; but from seemingly out of nowhere the winds would whistle and bring with them driving rain not unlike that when there is a typhoon. It’s fairly stable now and Gener has obviously left for good. I will remember that system for a long time as the storm that never really was; but what damage it left behind!